Building a strong relationship with parents is one of the most important steps a teacher can take towards establishing a productive and rewarding school year. As a teacher and a parent, I have learned to appreciate the value of a strong home–school relationship and the positive impact it can have on a child’s educational experience. Below are just a few tips for simple things you can do to help build a relationship with parents. 1) Daily Classroom Updates – A quick email to parents at the end of the day can be one of your most powerful tools for getting families involved. In your email, highlight the major accomplishments of the day, new concepts learned, and maybe some areas that may need some extra attention at home. Include a few questions about the day parents might ask. Don’t make the questions too difficult. Your goal should be to generate conversations at home, not frustration. 2) Weekly Newsletter – If a daily email sounds too ambitious (It’s actually easy, I promise! ), or if you try to spend as little time behind a computer as possible, a weekly newsletter (printed or digital) is a great tool for keeping parents updated and informed. Similar to daily email updates, a weekly newsletter can include an overview of what’s being covered in class, follow-up questions for parents, and any relevant news (such as important dates, upcoming events, etc.). 4) Use the Contact Information! – Now that you have phone numbers and email addresses, reach out and get to know the parents. Do your best to learn their names and faces. During your first contact with the parents, share something positive about their child. It’s amazing how powerful a two-minute call can be. 5) Invite Parents into the Classroom – Make parents feel welcome by inviting them to volunteer in the classroom or participate in special events. Additionally, give parents an opportunity to voice their input and help be a part of classroom decisions. 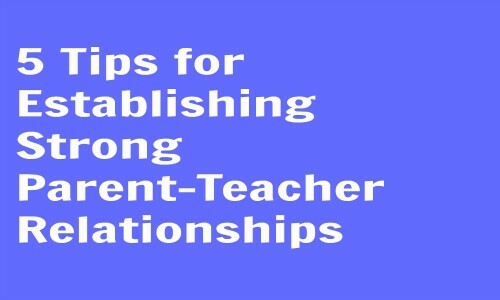 This is far from a complete list, but implementing even a few of these tips early in the school year should help to foster a stronger parent-teacher relationship. Find more teacher management resources here.